Azarenka tonight in the second round of the BNP Paribas Open in Indian Wells. 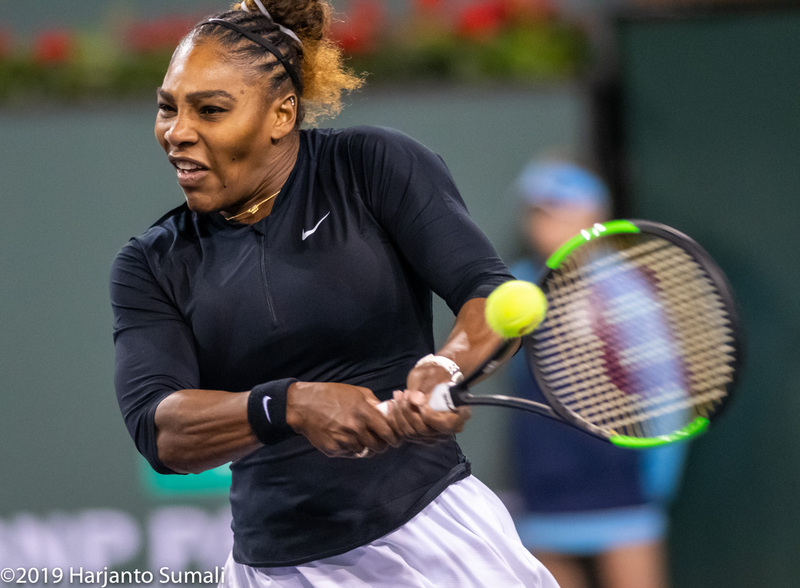 Serena Williams, a part-time Silicon Valley resident, defeated Victoria Azarenka 7-5, 6-3 in a scintillating featured match tonight in the second round of the BNP Paribas Open in Indian Wells. Tennis Channel commentator Lindsay Davenport called the 2-hour, 6-minute battle of mothers and former world No. 1s the highest-quality match on the WTA tour this year. Williams, ranked and seeded 10th, had not played a match since losing to Karolina Pliskova in the quarterfinals of the Australian Open in January. Still, it had the intensity of a Grand Slam final as she and Azarenka, ranked 48th, traded punishing groundstrokes. Williams improved to 18-4 against Azarenka in their first meeting since the 2016 Indian Wells final, which the Belarusian won 6-4, 6-4. Williams defeated Azarenka in three sets in the 2012 and 2013 U.S. Open finals. Both players have won Indian Wells twice. They also combined for four titles in the Bank of the West Classic at Stanford, with Williams winning three (2011, 2012 and 2014). The tournament ended a 21-year run at Stanford in 2017 and was replaced by the Mubadala Silicon Valley Classic in San Jose. Williams is scheduled to face another former world No. 1, Garbine Muguruza, on Sunday. Muguruza, seeded 20th, beat American wild card Lauren Davis 6-1, 6-3. Williams is 3-2 against Muguruza, who won twice on clay. Their last two meetings have come in Grand Slam finals, with Muguruza winning her first Grand Slam title in the 2016 French Open and Williams claiming her sixth of seven Wimbledon crowns in 2015. Also today, Stephanie Voegele, a Swiss qualifier ranked No. 109, improved to 5-1 against Fresno product Sloane Stephens, ranked and seeded fourth, with 6-3, 6-0 victory in 68 minutes in the wind. In the opening round of men's singles, San Francisco Bay Area native Mackenzie McDonald topped Joao Sousa of Portugal 6-4, 3-6, 6-3 for his first main-draw victory at Indian Wells. The 23-year-old McDonald starred at UCLA, a two-hour drive west of Indian Wells. He will play 14th-seeded Daniil Medvedev of Russia on Sunday. Medvedev beat McDonald 7-6 (3), 6-4 in the second round of qualifying in Toronto last August in their only previous meeting. --Top seeds and 2016 champions Pierre-Hugues Herbert and Nicolas Mahut of France edged John Isner of Dallas and Sam Querrey, a 31-year-old San Francisco native, 6-7 (3), 6-4 [12-10]. Isner won the title last year with compatriot Jack Sock. --Ben McLachlan (Cal, 2011-14) of Japan and Jan-Lennard Struff of Germany defeated Rajeev Ram of Carmel, Ind., and Joe Salisbury of Great Britain 7-5, 6-3. --Raquel Atawo (Cal, 2001-04) of Sacramento and Katarina Srebotnik of Slovenia dismissed Miyu Kato and Makoto Ninomiya of Japan 6-3, 6-1.